Lest you think that my family subsists on cookies and cake alone, I need to share something very special with you. And not "special" in the complicated sense, either. Nay, I am here to offer you not only something savory (!! ), but also the kind of recipe that does that magical job of making everyone think you are a freaking genius, when in actuality it was really quite simple. The sort of thing that requires a smattering of lightly dressed greens and a glass of wine and nothing else. I live for this kind of recipe. Now before you sort of freak out about it being a soufflé and all, let me let you in on a little secret: all the hype is totally unfounded. Seriously! So there will be no fretting, there will be no stress, and Lord knows there will be no shushing your heavy-footed family members so they don't send vibrations through the floor and inadvertently deflate your soufflé. It will be so super fun! Take my hand, dear readers, and let us soufflé. And I mean that in the least awkward way possible. So here's how a soufflé really breaks down: First, you're going to separate a bunch of eggs. The whites are going to go into the bowl of an electric mixer with some cream of tartar and you're going to forget about them for a while. The yolks are going to go into a little bowl somewhere near your stove. On the stove, there will be a medium-ish saucepan. You're going to melt some butter. Then whisk in some flour and let it cook for a minute so it doesn't taste all raw. Whisk in some milk, fast, so there's no lumps. Let it bubble and thicken. You've now made a béchamel! You are SO FANCY. Some dessert soufflés begin with a béchamel like this one, and sugar, fruit purees and maybe chocolate would have been in the mix as well. (Other fruit soufflés are even easier and don't have a cooked base at all--that's another show.) But I am blowing your mind by going savory today, remember? So now that the béchamel is made, you can get crazy creative. For savory soufflés, This is when you can add more spices, herbs, grated cheeses and vegetables that don't require a lot of cooking, like the fresh corn I've been obsessed with lately because I know it's so fleeting. 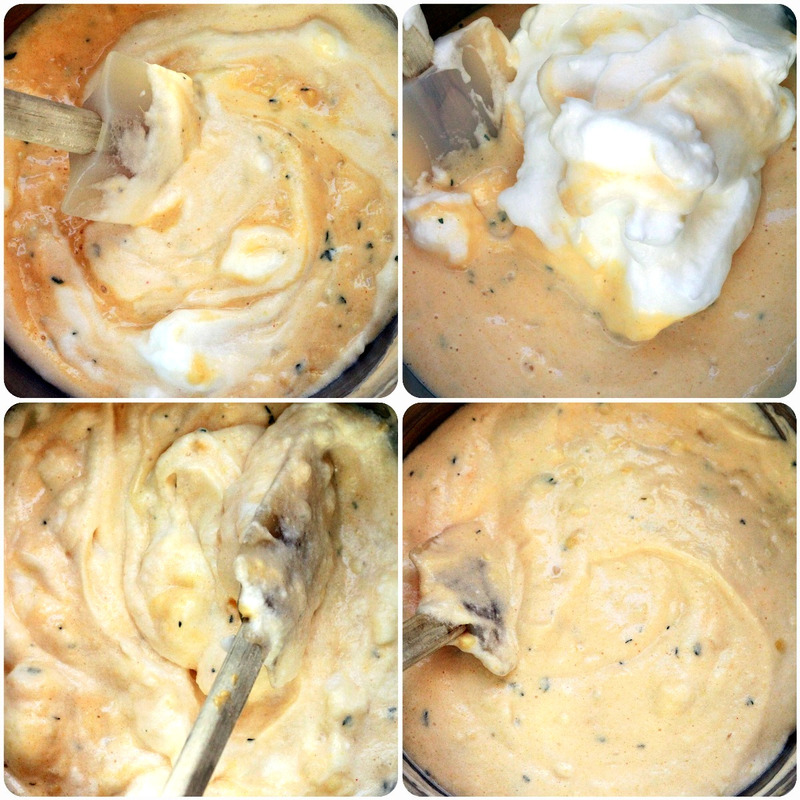 Once you've mixed some flavorings and tasty bits into the béchamel, then whisk in the egg yolks until everything is smooth. Scrape it all into the biggest mixing bowl you've got and set it aside to cool. This, my friends, is the base for your soufflé. I know it doesn't look like much, but seriously, you are almost done with your soufflé batter at this point. Really! We've just got to add our whipped whites and get some air and structure up in here. So go back to the bowl that has the egg whites and whip them first on medium-low speed until frothy, then on medium-high speed until you get firm peaks, which is to say that when you lift the beaters, you get a peak that stands straight up and doesn't schlump over onto itself at the tip. Now. I know I said this wouldn't be stressful, but if you're going to perk your ears up at anything, let it be this: DO NOT OVERWHIP YOUR WHITES. We want them firm, but still glossy, not dry and crumbly. Also! DON'T WHIP THEM AT HIGHER THAN MEDIUM-HIGH SPEED. We want to build structure and air slowly into the whites, a network of tiny, tight bubbles. If you whip at too high a speed too quickly, you'll get larger bubbles that will burst easily, and you can actually undo your work and knock air OUT as they whip. I don't know about you, but I don't have the kind of time to be all getting in my own way like that. Okay. We've got our savory, corny, cheesy base. We've got our whites all billowy and whipped. It's go time. What you see up there is the best way to get two very differently weighted materials together. The base is quite heavy--lots of fat and some starch and what not. The whites are very light, super delicate, really prone to deflating if you weigh them down with something like that heavier base. So we get the base to cooperate by stirring in about a third of the whipped whites first. Once the base it lightened, you can scrape in all the whites and very gently incorporate them by folding them in, gently turning scoopfuls of the lightened base over the whites, rotating the bowl as you work. Once there's no more streaks of whites in the mix and the batter is even and smooth, scrape it into a buttered soufflé dish. For this savory recipe, I also dust the whole buttered dish with finely grated parmesan cheese; for sweet soufflés, you'd use sugar--the dusting of whatever gives the batter something to cling to and help it climb up the sides of the dish. A round dish with straight sides will give you the best rise, just FYI. And guess what? That's pretty much it! Just pop that puppy into a hot oven, and let it do its fabulous soufflé thing. Which is to say the heat will make the air inside all those tiny bubbles expand and grow the whole thing into a glorious, pillowy mass. And when it's done and you carry it to the table to a lot of oohs and ahhs and applause, make sure someone is there to snap a photo of you with the halo of genius that will be surrounding your entire person. It really is a spectacular moment. Of course you can use thawed frozen corn if you can't get fresh cobs. Of course you may swap out the thyme for fresh basil. But you may not use dried herbs here. I'd rather you go without them than use dried--it tastes like dust in this recipe. Trust me. Once you get the soufflé in the oven, avoid opening the door if you can. Use the oven light to check on it if you have one. But if you notice that the soufflé is getting much more brown on one side than the other, you can quickly and very carefully rotate it in the oven after the initial 20 minute bake. You have a few make-ahead options here. The best one is to make the base several hours in advance, chill it, bring it back to room temperature, and then just whip the egg whites when you're ready to get it all together and bake it. You can also assemble the whole thing and refrigerate it until baking, but you risk losing some rise, and I wouldn't recommend doing that any more than two hours ahead. Position an oven rack to the lower third of the oven and preheat it to 400 degrees. Generously butter a 2-quart soufflé dish (including the rim!) and dust it all over with Parmesan or Pecorino cheese. Set the dish on a large baking sheet. Place the egg whites and cream of tartar in the bowl of an electric mixer fitted with the whisk attachment. Place the yolks in a small bowl. In a small bowl, whisk together the flour, cornmeal and paprika. In a medium sauce over medium heat, melt the butter. Add the garlic and saute just until fragrant, about 30 seconds. Add the flour all at once and whisk quickly to blend. Cook for 1 to 2 minutes, whisking constantly. Whisk in the milk in a steady stream. Bring the mixture to a simmer, whisking all the while, until the sauce is thickened, about 2 minutes more. Add the corn kernels and cook for 3 minutes more. Stir in 1/4 cup cheese, the thyme and salt. Remove the pan from the heat and whisk in the egg yolks until the mixture is smooth. Transfer the soufflé base to a large bowl and set aside to cool, stirring occasionally to help the cooling process along. Whip the egg whites and cream of tartar on medium-low speed until frothy, about 1 minutes. Raise the speed to medium-high speed and whip to firm peaks, about 2 to 3 minutes more. When the base is just warm to the touch, stir in a third of the whipped egg whites to lighten it. Gently fold in the remaining whites until no streaks of egg white remain. Scrape the batter into the prepared dish. Bake for 20 minutes at 400 degrees. Reduce the oven temperature to 375 and bake until the soufflé is golden and risen and firm to the touch, about 25-40 minutes longer, depending on how firm you prefer your soufflé to be. (25-ish minutes will give you a soft, almost saucelike center, 40 minutes will give you a soufflé that is set all the way through, which is what I like.) Serve immediately.